What is really wrong with the Australian Film Industry? Nick a struggling Greek-Australian actor, has written a screenplay about the relationship between himself and his now deceased father. Following in his father’s footsteps as an actor, he has cast himself in the lead role. The son of an international movie star wants it – under his terms – and so the negotiating begins. Nick comes to realise that it is easier to survive the rough back streets of Marrickville than it is to survive the sophisticated boardrooms of the Australian Film Industry. He is faced with a difficult choice – let go of his dream to enter the “club” or hang onto his dream and be forever waiting in line. What would you sacrifice if you only had one chance to get in? Alex Lykos has written a funny and interesting play about ‘the industry’. The struggling, creative artist, be he writer or actor loses out every time to the business men, the money makers, the ‘negotiators’ to whom unethical practices have become the norm. Interlaced is the importance of our personal relationships and how they dictate our actions. The play asks us where we might draw the line. 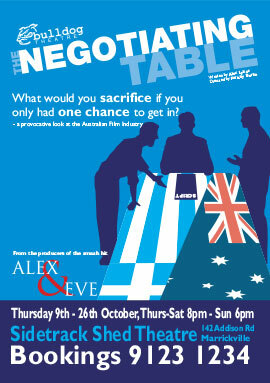 The Negotiating Table was the first play produced by the Bulldog Theatre Company in 2006 at the now closed Crypt Theatre in Balmain. This tiny Theatre could hold approximately 45 people and with the show taking place from the 11th – 22nd of January the Crypt could have been renamed the oven! In a bid to keep the audiences and actors cool in the sweltering heat we brought in multiple fans to try to cool the tiny underground room down, it worked in one aspect but the noise from the fans sometimes threatened to drown out the actors. Nevertheless the season was a success with sold out shows every night, Bulldog Theatre Company was officially off and running! In 2008 we decided to revisit our first play with a new cast, new director and (thankfully) better theatre, oh, and we avoided January. From the 9th to the 26th of October audiences were able to enjoy The Negotiating Table at the Sidetrack Shed Theatre in Marrickville for a very successful return season. The premier production for the Bulldog Theatre Company took place at the Crypt Theatre in Balmain for a two week run with shows on Wednesday – Sunday.